We’re all familiar with the phrase, “watch your step.” It doesn’t just pertain to walking on a sidewalk or path, it holds true to elevated surfaces, especially stairs. Stairs can quickly become you're worst enemy if you don’t step on them properly. At the beginning of summer my friend decided that it was time for a furniture face lift; so I helped her move pieces out of her home. While carefully carrying her couch down her staircase she slipped and fell down several steps. Her fall resulted in a severely sprained ankle, which was debilitating; and to make matters worse it was the beginning of prime time beach season. Looking back, I've thought about all the ways in which her fall could have been prevented. She should have been wearing proper shoes (sneakers not flip flops). We should have cleared the stairway before moving anything, especially at the top and base of the stairs (clutter definitely hindered our path). Her beautiful, yet slippery, hard wood floors could have been treated with some sort of clear anti-slip treads. Unfortunately, the fall occurred which at the time was out of our control. However, what we can control are the means in which we prevent it from happening again. 1. Take Your Time: There’s no need to rush down the stairs. A phone call or visitor at the door can wait. Be alert and deliberate. Hold on to the handrails and be extra cautious when there are any transition between surfaces. 2. Tread Lightly: If your stairs are made of a smooth material (wood, painted, tile, etc) install rubber, abrasive treads or anti-slip tape for proper footing and grip. You can find clear anti-slip treads that won’t take away from the beauty of your floors. If your stairs are carpeted, be sure the carpeting is securely installed and not sagging or loose in any areas. 3. Clear the Clutter: Keep the top and bottom of stairways clear of loose rugs; they are a tripping hazard. Remove any objects like books, shoes, clothes, kids toys, etc., and make sure that any furniture on landings doesn’t block the pathway. 4. Let there be Light: Stairs should never have lower illumination levels than adjacent areas; that’s just a recipe for disaster. 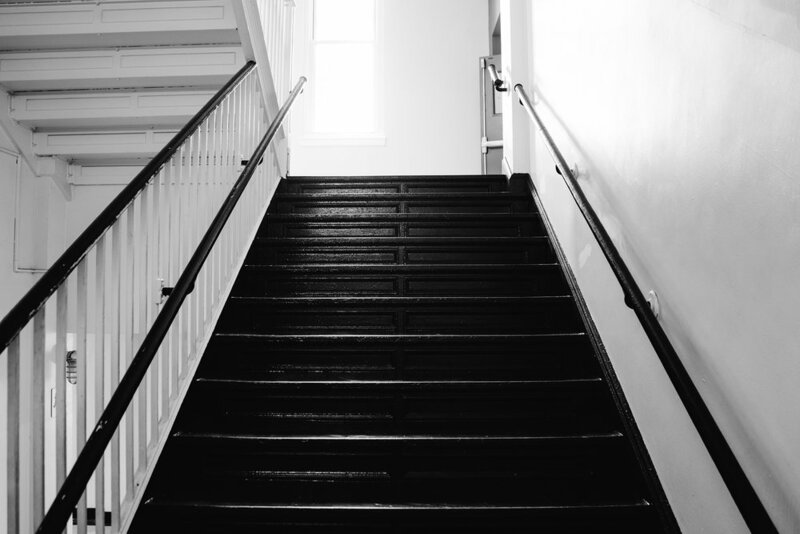 Use low-glare overhead lighting, and in senior homes install a stair lighting kit to ensure each step is distinctly visible. Verify there are light switches at both the bottom and the top of the stairs; if there aren’t, have them installed. 5. Use the Railings: Handrails are strongly recommended. In fact, it’s suggested they be installed on both sides of the stairwell when possible. Position handrails at adult elbow height and attach them securely to walls and posts. Be sure to extend them the full length of the stairs, including beyond the top and bottom. 6. Safe Soles: Proper footwear influences balance and can alleviate the risk of slips, trips, and falls. Walking indoors in socks, high-heeled shoes or even barefoot has been shown to increase the risk of falls, especially for older individuals. Be conscious of what is on your feet while moving up and down your stairs. At some point in our lives, stairs will become an issue for all of us. That doesn’t mean we have to stop using them entirely, or even be scared of climbing them. It just means that taking some extra precautions to make our stairways safe is important and necessary to remain injury free!